There is a triple-threat of total enjoyment from our new groomsman gifts, featuring our Personalized Dunbar Groomsmen Flask Gift Box Set. This gift set is comprised of an exciting sleek, black suede stainless-steel beverage flask, handsome corkscrew/bottle-opener, and a natural wooden keepsake box. Details:6 oz. 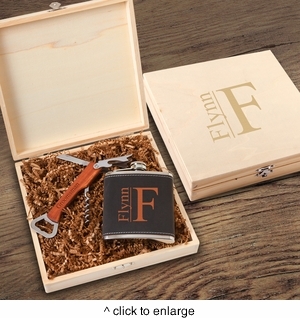 Flask wrapped color is black suede; personalization color is orange Bottle opener includes fold out corkscrew and fold out knife Personalized wooden box measures 8 3/8" x 8 1/8" x 1 7/8"